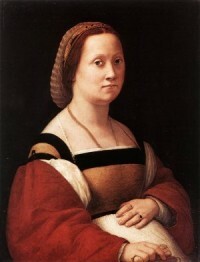 Raphael, La Donna Gravida (1505-1506). Some fifteen per cent of women suffer from depression during pregnancy, and the use of antidepressants in expectant women is on the rise. One study found that rates more than doubled between 1999 and 2003 for women on Medicaid; at present, about six to seven per cent of pregnant women take these medications. For women with a history of depression, the rates are far higher. Pregnancy can easily trigger a relapse, and those who discontinue medications during pregnancy are nearly three times as likely to relapse as those who continue to take their medication. Sampling of cord blood at birth indicates that the level of these medications in the fetal bloodstream is more than half of the level in the mother’s; the drugs are also present in amniotic fluid. Some studies suggest an association between S.S.R.I.s and certain types of infant cardiac defects (while another study has correlated S.S.R.I.s with a lower incidence of certain cardiac defects). There is also mixed data on antidepressants’ causal link to miscarriage, preterm birth, and low birth weight, and there is some support for a small increased risk of a lung condition called persistent pulmonary hypertension in the newborn. In about a third of cases, babies born to mothers on S.S.R.I.s develop neonatal adaptation syndrome, which involves jitteriness, reflux, and sneezing, but these symptoms are generally mild and often resolve within forty-eight hours — though neonatal seizures have occasionally been reported. Mice exposed to high levels of S.S.R.I.s during early development show reduction in sexual activity among adult males, inhibition of exploratory behavior, and altered REM sleep. All of this is of course terrifying to prospective mothers, who often choose against taking S.S.R.I.s because of these vague, hard to quantify, but undeniable risks. Some authorities have suggested that antidepressants during pregnancy may increase the rate of autism among offspring. Five studies on this subject have been published since 2011. Three found some association. Since a considerable literature supports parental or family history of depression and other psychiatric illness as a risk factor for autism, however, it’s hard to know whether the treated mothers were producing autistic children because they took medication or because they carried genes of psychic fragility. The largest study, a 2013 population survey conducted in Denmark, attempted to control for maternal depression and did not find any association between the drugs and autism. At the same time, it is important not to blame mothers for their children’s neurological challenges. The shadow of the “refrigerator mother,” who was said to cause autism, falls long across this research. It may be counterproductive to tell women under stresses they cannot avoid that they are damaging their children by being unhappy — or by being treated for their distress. Blaming some women for injuring their children by taking antidepressants and others for injuring their children because they are depressed creates a no-win situation that is itself depressing. There is no universal right answer here, and, under those circumstances, quoting the studies may seem counterproductive. But women need the leeway to make their own choices — to look, as one does in many areas of health care, at two unsatisfactory options and select between them, and to do so with as much information as possible. For some, the depression may be so acute that medication is clearly the best option; for others, the complications that could result from taking medication may be too terrifying to contemplate. Most will fall somewhere in the treacherous middle, and they will need to consult with physicians and psychiatrists to decide what to do. Some who choose not to take medication may need to change their minds during a pregnancy. The whole enterprise requires enormous flexibility in the face of uncertainty. Any false simplicity cheats women of their right to self-determination. There may well be women whose pregnancies are adversely affected by antidepressants; the number who experience significant and persistent problems is probably small. For those able to control their depression during pregnancy through cognitive-behavioral therapy or other non-pharmacological treatments, that is often the best option. Most women will try to make that work. But talk therapy alone is not sufficient for many depressed people, pregnant or otherwise, and the broader literature suggests that the risks associated with severe depression can often be more serious than the risks associated with medications. The debate rages, and the choice is a difficult one: to be depressed during pregnancy, with troubling consequences, or to be on medication during pregnancy, with unclear ramifications. It is not helpful when the complexity of the decision is belittled. “Everyone’s happier with this idea that the medications are O.K.,” Rabin wrote, quoting an expert. Everyone is second most happy learning, as Rabin suggests, that the medications are poison but depression is fine — because clarity and simplicity make life easy. If the meds help more than they harm, you take them; if they harm more than they help, you don’t take them. The problem is that this is a highly nuanced question to which there is no consistent answer, and about which we know too little. That makes everyone excruciatingly uncomfortable.